The bus station at Canada Water is situated above the new Jubilee Line Extension tube station. After arriving here by bus from neighbouring areas, people will be able to proceed by train to central London, and vice versa. Consequently, it was important that the bus station should relate to the exits from the tube station.The brief also called for bus shelters, a small block of offices, a services zone, public toilets, a bus control office and a kiosk serving refreshments. Due to the proximity of two high-rise blocks of flats, it was necessary to consider the potential effects of noise and pollution and the residents' view of the various parts of the bus station. The alignment of bus routes and waiting islands - together with the existing road system, the limitations of the boundary lines and the position of the tube station's main exit 'drum' - in turn determined the siting of the bus station building, pedestrian circulation, and the extent of the'cover'. The relatively large roof is the main element of the scheme. 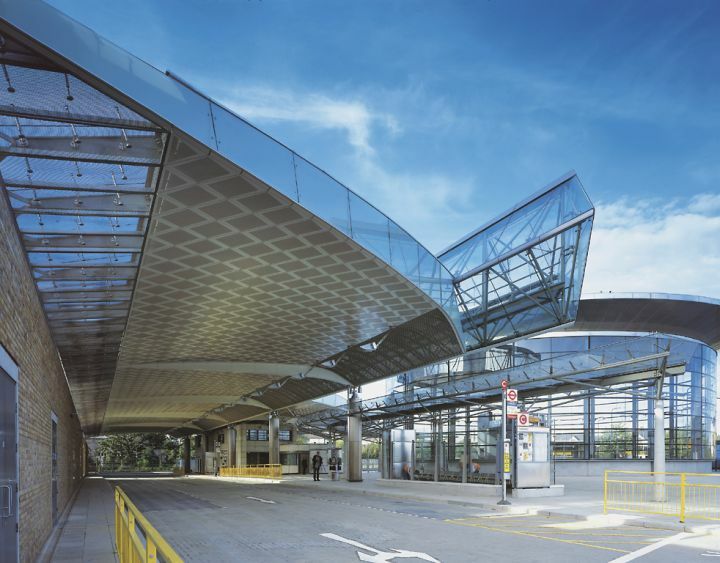 Although its primary function is to provide acoustic protection for the nearby flats, by virtue of its sound-absorbing qualities it also improves conditions for passengers waiting within the station.The roof- in the form of wings connected by a glass 'crystal' - brings light into the central waiting area and provides ventilation during the summer. The accommodation block in the centre, housing services for both the underground and bus station, is clad in reconstituted stone, with doors covered in rigidised metal to match the column cladding. Waiting areas are glass enclosures, situated under a low- level glass canopy that provides cover for passengers circulating between the drum and other waiting areas in the complex. The northern boundary of the station is framed by a glass wall, with a view to a garden, and on the west side a block housing the Canada Water underground services incorporates a vertical glass clerestorey which was necessary to complete the acoustic performance of the enclosure. A section of this side is also glazed, giving a view of a landscaped garden. To improve the environmental quality for passengers, the roof frames have glass ends to maximise daylight. At night the station is lit by uplighting from luminaires on the central column supports.The east side is formed by a mesh screen, a safety measure to prevent people from taking a hazardous short cut to the nearby residential development. Materials were selected to achieve an overall impression of calm and comfort.The London stocks specified for the west wall by the Jubilee Line Extension team determined the choice and colour of all other materials. Added sparkle was provided by the glass elements and stainless-steel fixtures.